Eunice Kennedy Shriver had a sister her name Rosemary Kennedy, who had an intellectual disability. Eunice watched her sister grow up her whole life and saw her bubbly personality and her unique potential. This is what gave her the idea, in 1962, to start a day camp for young kids and adults with intellectual disabilities. This is how the Special Olympics all began, in her own back yard. Eunice didn’t like how people with intellectual disabilities were being treated. She wanted more for her sister and people like her. She wanted them to feel accepted, respected and not to be teased. The very first Special Olympics Summer Games were held in Chicago, Illinois on Soldier Field in 1968. The sports were track, swimming, ball throwing and standing long jump. Over 1,000 athletes from all over the nation came to compete. Today, Special Olympics has grown, and the movement focuses more on Unified. Unified is a typical athlete playing with an athlete with an intellectual disability. It’s all about togetherness and playing with family and friends. This is what Eunice wanted for us all. Eunice Kennedy Shriver enjoyed working with people with intellectual disabilities. It was very rewarding for her to watch the joy upon athletes’ faces. Eunice was and is a remarkable and incredible strong-willed lady whose determination and dedication has changed the world and made the last 50 years so incredible. Special Olympics has change my life in ways I can’t even put into words. My parents and Special Olympic staff have made me who I am today. They have given me the courage to speak and share my story. Special Olympics to me means being accepted, respected, and not to be teased and bullied. It means to be part of something huge. Thank you, Eunice Kennedy Shriver—you are truly amazing! You started this movement and have changed my life. 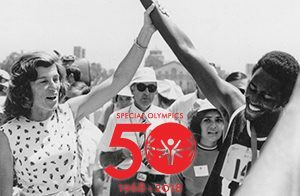 Fifty years of gratitude, dedication, determination, admiration, from all the athletes of dedicated to you, Eunice, and the future of Special Olympics! Inspirations By Melissa Giersch. Athlete correspondent.